We bumpedinto Jill and her husband Jack from GVI whilst we were in town and they invited us to their end of term party this weekend in Ao Luk. The party was great fun and I enjoyed meeting all the local Thai people. Many of the locals knoew Warner and were very happy and suprised to him again. They treated Warner as a son or grandson and would even call him so. I met Nong, Superchai, Pi Ban and Kitty; local people who Warner knew well. It was great to put faces to the names I had come to know so well through Warner's stories. 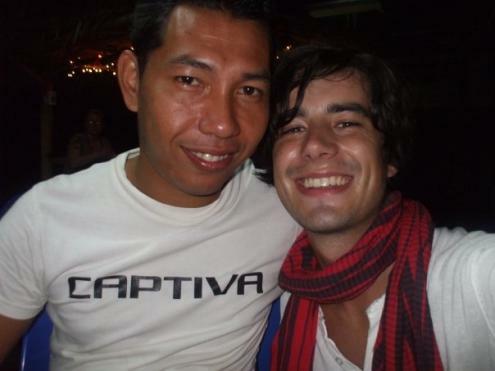 As well as the Thai people, I got to meet Jude who was one of the Interns at GVI when Warner was teaching. He had returned to GVI after teaching in China for the past year. Warner had told me many stories of his time on base and Jude was one of his closest friends during his time there. He lived up to my expectations to say the least, he is definetly a character and can certainly drink his whisky. It was also nice to meet a lot of new people including all the new volunteers. It was good trip for us both - especially for Warner who got to spend time with some of his old buddies.